Recently, JustAnswer.com changed its name to Pearl.com. What else changed? We’re not sure. The service is basically the same. Those with questions can log on and ask them of an “expert.” Before, you could leave a question and professionals would come along and answer. You choose the answer to accept and pay for that one only, and only however much you agreed on to begin with. Read our review of JustAnswer.com to learn more about making money with this Question/Answer service. this translates to you may or may not get paid for the answer you write. Previously experts earned a percentage of the amount paid for the question. There was also application information, a way to choose categories you would like to become an expert in, and even a way to apply on the site. This is no longer there and those interested in becoming an expert and earning answering questions are directed to send an email asking for more information. It is unclear whether the pay scale is the same. They have added testing in the area you want to answer questions in as a part of the applications process, in addition to verifying you credentials. I take this to mean that since I applied as an expert in finance and was accepted due to my BBA in Business with an accounting major, as well as my accounting experience, I would now have to take a test in the area of finance before I would be hired as an expert if I were to apply to Pearl.com. There are actual doctors, lawyers, mechanics and more answering questions, and you can chat with any that are online right away. It appears that they are currently charging a flat fee for answers that varies by category, so the pay scale may have changed to reflect that. I have sent an email asking for more information and will update this post if and when I hear back. 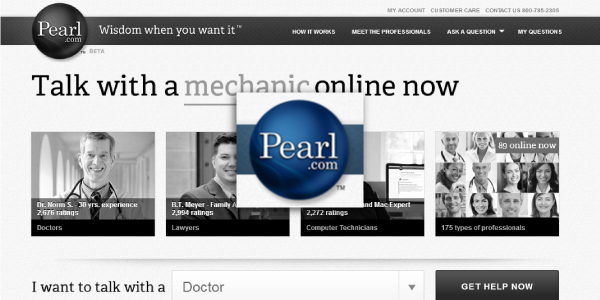 Until then, does anyone out there have any experience as an “expert” for Pearl.com? If so, please share! I was an expert for this website. I am one of the original auto mechanics on there, and I actually wrote some of the tests for their automotive category. I had a long and profitable relationship with Andy’s crew, when it was called JustAnswer, until one day (out of the blue) I found i had been terminated from the website. My average pay was around 2500 a month, and I would only help a handful of people each day. I am quite sure they still use the test questions that I wrote for them, though. BILLY BURNS UP CUSTOMERS MOTOR! NOW SLIGHTLY EDITED TO SHOW NEW EXPERT TRYING TO RESCUE BILLY FROM CATASTROPHIC WIRING CALAMITY! NOTE BILLY1961’s SMARTASS REMARK AFTER NOT BEING ABLE TO COMPETE! SAYS IT ALL! AND THIS RUDE IGNORAMUS IS STILL ONLINE ! NOT ONLY THAT BUT HE IS THE HVAC MENTOR! HOW WELCOME WOULD YOU FEEL IF THE FORUM MOD IS ABUSIVE IN PUBLIC! yes…but i think thats wrong and it may have burned the motor…is there difinitive right and wrong way? which method should I try next? and will either further damage the motor? the damage would be if it was wired with both brown wires on one cap terminal and the motor white to other cap with furnace white to motor white terminal. One capacitor with the 2 brown…one on each not both on same side. ask anything at all to make this easier. We will keep working on it. Keep me posted with questions. Huh?? There was no competition, malice or derogation intended. I have an A.S.degree in Mechanical Electrical Technology, I am here to assist only and have referred to accepted & common knowledge on a motor. you’ll have to let me know what you are referring to,If you are not kidding,that is a generally accepted fact for the color leads on a motor. Just as a thermostat has RED=24v WHITE = heat YELLOW = cool GREEN = fan So are 99% of all motors White = common, Red = low, Black = high and browns go to the capacitor. If you have a specific factual error I made please include this as merely comparing credentials is unfair as I have a 2 yr degree. I have never nor will I ever malign lesser qualified contemporaries especially regarding such a basic accepted norm. l it burns it out! Line 1 goes to common and line 2 goes to the motors desired speed, low or high, you never ever put line 1 and line 2 both on the run winding! A run capacitor has 2 terminals and they are the run and start windings. The ONLY time you may run a leg of power to the cap is if it has 1 speed ! Multi speed motors require 1 leg of power directly to Common! Anyone who does not know this is a magazine mechanic! IMAGINE BEING A NEW EXPERT WHO SUCCEEDS IN WINNING OVER CUSTOMERS BILLY1961 HAS ANSWWERED 1ST! I will opt out and ask you credit the expert Billy. Explanation That was way brighter than most of us here, including me. why did you opt out? Months and 100 + abusive negative peer reviews later, Billy interjects while factually incorrect and proven so, returns a 2nd time & harasses in public! before the customer and negative peer reviewed as well. Expert: Chas replied 1 hours ago. Hi, I noticed another expert posted on top of me. Please note this expert just showed up today and has no satisfied customers. I wanted you to know that in advance before you spend money on his answer or the part he wants you to replace..
NICE! 2 EM,BEDDED TROLLS FIGHTING FOR THEIR STATUS ABUSING IN PUBLIC WITH NO FEAR OF REPERCUSSIONS AS EVIDENCED! JUSTANSWER is a Total scam site! the rating JustAnswer/Pearl has for their “experts” is for the positive rating! which means double billed customer as accepting is required to rate! Many many customers do not notice the skimming on their card until months later where it has accumulated to a ridiculous amount for JUST 1 question and likely did not get even a correct answer ! whom they mow through and spit out, there are no 1099’s EVER! THIS EVIDENCES THE RUDE ABUSE A NEW EXPERT GETS!